Rwandan President Paul Kagame has challenged African envoys based in China to pursue win-win partnerships as they engage with the rest of the world to facilitate the continent’s quest for development. Kagame made the remarks on Sunday afternoon while addressing African ambassadors based in China while on a visit to the Asian nation. President Kagame said that the African continent ought to keep strengthening and improving the quality of partnerships globally and ensure that they present win-win scenerios. “We can always keep strengthening and improving the quality of such partnerships, which must be win-win. Even in the case of Europe and the US, we must continue to emphasize our ambitions and ensure that we get fair deals out of these partnerships” Kagame said. The African continent, he said has all preconditions for development including human capital and material wealth and ought to fit in the global scene as equals as opposed to continued dependence on partners. “It is my belief that we have everything that we need to succeed, with all the wealth that we possess in our countries; beginning with the most important which is human capital. Second in terms of material wealth, we have as much as the rest of the world” he added. “How can we continue to accept that tax payers of other countries are the ones who toil to take care of our livelihood? We should manage ourselves and our resources. 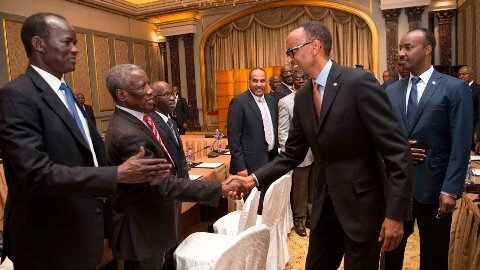 We should fit into the global scene as equals, because we lack nothing,” Kagame told the envoys. Among the ways that the continent can become independent and spearhead its own development, the President said was by engaging in investment opportunities beneficial to Africa.